Braehead Clan head coach Ryan Finnerty has backed his side to recover from being knocked off top spot in the Elite League table. The Glasgow side lost 6-2 at Fife Flyers on Saturday and 4-1 at Sheffield Steelers on Sunday as Belfast Giants hit the summit in the league. But with two matches at home to Sheffield this weekend, Finnerty is staying upbeat. "It can't be doom and gloom because we've lost two games in two very tough buildings, so we have to keep a level head and move on," he said. "We have to demand more from ourselves and with Sheffield coming to Glasgow next week, Sunday's game has given us a better idea of what to expect." Chris Auger's hat-trick on Saturday ensured a good night for Fife Flyers as they beat the Clan in Kirkcaldy. Jamie Milan edged Fife ahead before Kyle Haines' double made it 3-0. Auger scored a fourth in the second period, but Scott Pitt replied for Braehead. Another two from Auger, either side of a Ben Davies finish for the visitors, sealed the win. On Sunday, Tyler Mosienko opened the scoring for Sheffield and after Pitt squared it, Mosienko completed his hat-trick and Jay Latulippe added a fourth. 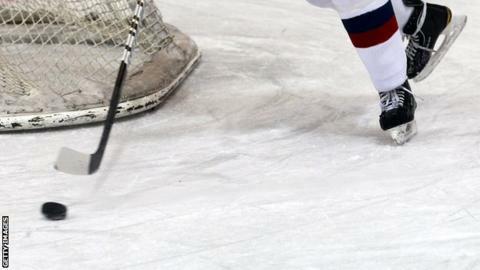 Dundee Stars are at the foot of the table after squandering leads to lose both of their weekend fixtures. Shane Lust and Chris Blight gave Dundee the lead but a Daniel Naslund double and Jade Portwood's goal sealed a fine 3-2 triumph for resurgent Edinburgh Capitals - their second win on the spin. Stars then slipped to a 5-4 defeat at Cardiff on Sunday. John Mitchell fired the Tayside men into the lead before Brent Walton and Joey Martin handed the hosts a 2-1 advantage. Lust, Jeff Hutchins and Ryan Grimshaw sent Stars 4-2 up but Andrew Hotham, Jesse Mychan and Matthew Myers struck to leave Dundee sick. Edinburgh Capitals rounded off their weekend with a 4-3 win over Fife Flyers. Player-coach Richard Hartmann struck first for the Caps before Matt Reber levelled. Scott Fleming put Fife ahead but Edinburgh fought back with Rene Jarolin and Portwood giving them a 3-2 lead. Bobby Chaumont equalised again but Hartmann clinched a huge result for the Capitals. Flyers' coach Todd Dutiaume said: "We played OK, but not as great as we played on Saturday. It was scrambly at times and the guys will be regretting that one. "Overall we can be positive about the last two days and we're in a position where we can nitpick."